"Bring them in, Build them up, Send them out." There has been an active Presbyterian presence in Tappahannock since 1996. 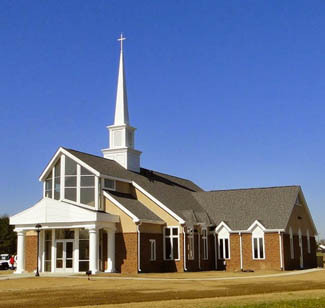 The Tappahannock Presbyterian Church meets every Sunday morning at 10:00 for a traditional service in the new Tappahannock Presbyterian Church. It is located at 204 Kino Road, opposite Chandler Chevrolet on Route 360 West, approximately 2 miles from Tappahannock on the Richmond Highway. [Directions]. Dr Vicki Murdock pastors our flock. [View her profile] She is a graduate of Union Presbyterian Seminary. The church office is open Tuesday, Wednesday, and Thursday from 9:30-1:00 p.m. the phone number is (804) 443-9977. Calls left on the answering machine will be answered as soon as possible. Persons requesting financial assistance are referred to Tina Vencell at Social Services-(804) 443-3561 where they may be more fully served. Check out the church's activities with Operation Inasmuch and recent projects with Essex Churches Together. Catch up with our Tappahannock Presbyterian Church Newsletters in PDF format Church Newsletters at Church Newsletters - prior years newsletters can be found in the Newsletters Archive.